In an earlier article, we read of the Devil's war against St Gemma, and how he tried to seperate her from her loved ones. Like her Master, GEMMA has been a sign of contradiction, both during her life and after her death. Few have found such devoted friends or such malignant foes as Gemma. During her life and especially after her death she brought forth the most enthusiastic admiration or the most intense hatred. Her desire to share in all the ignominy and shame of the Passion was certainly granted to the full; from her earliest years her thoughts had turned to Jesus’ torments and suffering and she ardently desired to be likened to "the man of sorrows " and Jesus did not disappoint her of her desire. 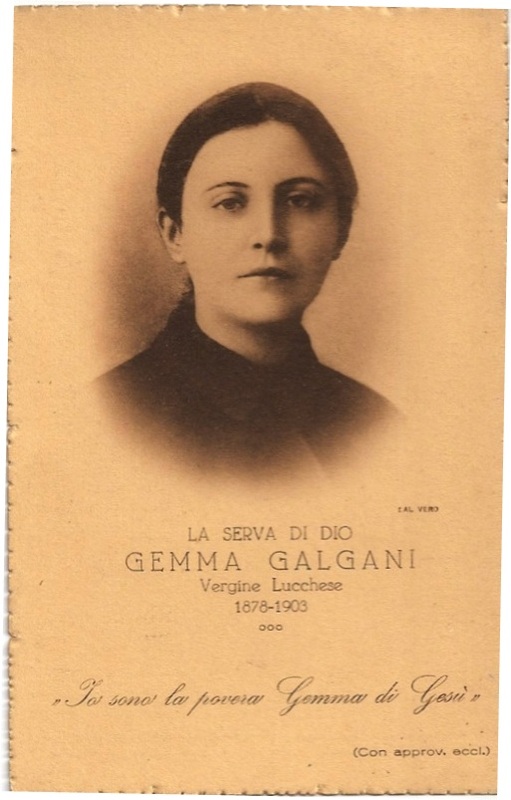 Perhaps the one who caused her the most acute suffering was Father Gaetano who, first of all so enthusiastic in his admiration, afterwards became her most uncompromising foe. Gemma herself says that only in the Day of Judgment shall we understand the reason of this complete change in his attitude. The fruitless visit of the doctor, and the doubts and hesitations of Gemma's confessor since childhood, Monsignor Volpi, gave the first shock to Father Gaetano's faith in Gemma. When he came back to Lucca he repeated again and again the experiment of the doctor, he washed the wounds, which a moment afterwards began to bleed afresh; he was reassured and wrote to Mgr. Volpi professing his belief in the reality of the stigmata. He was not alone in his observations, for members of the Giannini family and Signora Cecilia watched very attentively every phase of the ecstasy from beginning to end, and especially after hearing it said that Gemma had made the wounds herself. At a certain point in the ecstasy the blood began to flow, and after the blood was washed off it began to flow again, and when the ecstasy was over the wounds closed by themselves. If these wounds had been made by Gemma how could they close instantaneously of their own accord! The remark of Signora Cecilia as she held the handkerchief soaked with blood in her hands was certainly justified: "If this is hysteria I do not know, but it seems to me they are mistaken in thinking so." For a time Father Gaetano held faith in Gemma, but his opinion soon changed into complete disbelief and undisguised hostility. He did not, indeed, attribute the ecstasies and the stigmata to hysteria, but to satanic intervention. "You see, Jesus," she exclaimed, "how I am surrounded by enemies who do not believe in your work. But what does it matter? I only desire one thing, that you should be pleased with me. You have nothing to reproach me with? No! Then, Jesus, I am quite content!" "Jesus, I commend to you my great enemy, my great adversary. Guide him, and be with him. If Thy hand be heavy against him, let it fall not upon him, but upon me. I wish him so much good. Do not forsake him, but console him. It does not matter if You leave me in the midst of sorrows, but him, no! I commend him to You now and always. Jesus, I implore You to help and console him. Give him Your grace abundantly; give him dou ble the grace for all the evil he has purposed against me. Vindicate myself? No, Jesus, with Your help ... each morning I commend him to You. Guide him, and if it seems good to You, make him keep silence, not for my sake, but Yours .... And as a proof that I wish him well, tomorrow I shall make my Holy Communion for him. He perhaps thinks to do me harm, but I, no, I desire his good so much, so very much!" Gemma had foretold that Father Gaetano would leave the order, a thing he believed to be impossible and it was one of the things that helped to increase his hostility. But a day came, as Gemma had foreseen, when her prophecy was fulfilled, and Father Gaetano left the congregation and became a secular priest. Towards the close of his life he returned to it, but the Holy See forbade him to preach or hear confessions. He passed his solitary hours in making sandals for the brethren. Son of a shoemaker, at the end of his life he returned to the work of his childhood, and returned likewise to his first esteem and admiration for Gemma. He no longer looked upon her as deluded or considered the extraordinary facts manifested in her the work of the Devil. Instead, he invoked her and was filled with grief for his un¬belief and for all the harm he had done her, and finally died a holy death through the intercession of his heavenly patroness. "Oh father, I went to confession today at 5 o'clock and the confessor said he would take Jesus from me. Oh father, my pen refuses to write, my hand trembles, and I weep. Blessed be Jesus, who at last has found one who knows me, and will help me to go to Heaven. No, I am not worthy to receive Jesus into this worthless heart of mine. Yet how many times Jesus has been pleased to come! In this moment I do indeed realize my misery.....After hearing my confession the confessor sent me away and threatened to stop my going to Communion, saying he wondered how he had so easily given credit to the Evil One. "This morning after communion I asked Jesus to explain this mystery to me and Jesus said: 'Daughter, it is no longer the time to treat you like a little child. The time has come for you to be cruelly tested but I will give you all the help you need.' Yesterday, when the confessor believed it was the Devil who was working in me, he forbade me to think of Jesus and told me to make my communion like the others and not cause annoyance! [That is, not fall into ecstasy after communion as she generally did.] Oh father, this also I foresaw. But how to do it? Have I then deceived everybody? What will happen to me? I think of my soul and of the Holy Communions that I have made in sin! I shall die of grief for the great evil I have done to Jesus. No one speaks a word to me. But Jesus, yes, Jesus is with me, in my heart, and with Him I am unafraid! "I want to say, to say--but no, I am afraid! I do not wish to deceive anyone. Forgive me. I do not believe I have deceived anyone, neither the confessor, nor the others. Help me, I will be good, I will obey, I will not sin any more. Jesus, Jesus, give me part in all Your pain, to suffer and love, to suffer for Jesus who loves me, to die suffering for Jesus. And must I remain deprived of Jesus, for whom I long so much? Jesus, have I indeed lost Your Grace? Still in the midst of all my unworthiness I love You....I love You passionately. I shall die yes, die, but of love and sorrow for You! Father, revive my courage. The more insignificant I see myself to be, the more I want to love Jesus. His love intoxicates me, I am alone with Jesus." This letter gives an idea of the conflict which Gemma experienced as the result of the doubts of her confessor, the struggle between the certainty she felt that she had neither been deceived nor deceived others, and on the other hand the dread that the confessor might be right, and she against her own will really mistaken and misled by the Evil One. This is an agony only a sincere and upright soul like hers can really experience. "Jesus has sent me a little tribulation for the profit of my soul. I must then accept it gladly, moreover, I ought to desire and look for it, and value the desolation and pain, more than spiritual consola¬tion. Instead what have I done? You know already. I am content and have given myself wholly into the hands of God, and completely renounced my own will. I seek Jesus but only that He may help me to do His will. I have also learned another thing, not to go thinking and searching within. I have commended everything to Jesus and live in silence and peace of heart. "Forgive me if I have written nonsense. I suffer even in writing, but what does it matter? Nature always seeks consolation within and without, is always looking for a little ease. I must do my best to force myself. Jesus inspires me to do this under your obedience. Jesus has left me alone in the world, and I ought not to concern myself with anyone. I should converse only with Him, and not meddle with anything else. But instead? I should be thinking of my sins, and in how much I am lacking in order to be a worthy daughter of Jesus, and instead I ought to fight valiantly and use force to conquer myself instead? If Jesus is all mine, who can vanquish me? My sins, indeed, make me afraid, but His mercy assures me that if I am penitent and abandon myself to Him, I shall possess Him. All I can do is to humble myself beneath the mighty hand of God, without seeking my own pleasure in anything." And again: "What a time of darkness! I have seen nothing of Him, even though He is with me. Every morning I receive Jesus but I do not feel His presence. All that has vanished and worse still I can no longer remember past days. How have I lived up to this time? I know not how to answer! But my Jesus! Father, where is He? Poor Jesus, and verily poor me! What can I give to Jesus for all He has given me? What shall I offer for the great mercy He has shown towards me? I am so ungrateful after so many graces, I have so often resisted His inspirations, added sin to sin, I am not worthy that Jesus should look upon me. I see clearly that I have grieved Jesus, and therefore He has left me. . . . But was not Jesus once my all? And I still consider Jesus my Father; is not Jesus the Father of mercy, the One who receives sinners? And He has left me. No, it is not true, father. Jesus alone is my hope, but I am so weak." The depth and complexity of the psychological processes going on in her life is incredible. It is amazing that victim souls can deal with so much emotional trauma and trial and keep it together so to speak. The difficulty of dealing with the pain of stigmata would be hard enough without the stress of feeling like Jesus had left you.